A measure of any good horror writer is the short story. Many of the genre’s most famous and influential works, such as “The Tell-Tale Heart” by Edgar Allen Poe and “The Call of Cthulhu” by H.P. Lovecraft are short stories. Today, the tradition of horror writers crafting the short story continues with modern masters, like Stephen King and Jack Ketchum, regularly putting out collections of their shorter works. 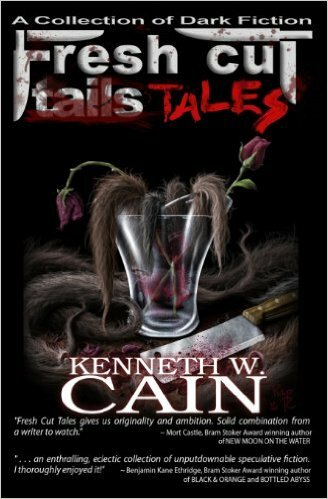 In Fresh Cut Tales, Cain tackles a range of subjects and subgenres. “Ordering Out” is the humorous character study of a germophobe vampire, while “Of Shadows” is written as a very clear analogy to the real world struggles and horrors of abuse. Others, such as “In the Shadow of the Equine” and “Warmth within Thy Depths,” take on a more cosmic horror feel. Some of the strongest tales focus more on psychological horror and the subversion of the other. “Shards” is about a man who has some serious mental issues regarding infants. He utilizes dolls to act out his pent up rage. Until now, he has done a good job of hiding his hatred of newborns from his wife, but can this continue when he learns that they are expecting? Most of the short stories, in Fresh Cut Tales, move towards setting up a big reveal, twist, or revelation of some form or another. Sometimes, this works to brilliant effect. However, in other instances, it can be frustrating to the reader. Often, it is incredibly clear that key information regarding the characters or narrative is being withheld. Twists and unexpected endings work best when the reader does not see it coming. There is no surprise if the reader understands from the get go that they are not being told the whole story. If short stories are a good measure of a horror writer, Cain represents himself well. The diversity of stories in Fresh Cut Tales demonstrates that the author has a wide array of tales to tell. While the delivery of these might be improved upon, Cain is relatively young author and already performing head and shoulders above many of his peers.